This is an app for FatFingers.com which is a site that allows you to search ebay for those tucked away bargains when people have listed something but had a bit of a misspelling when listing. 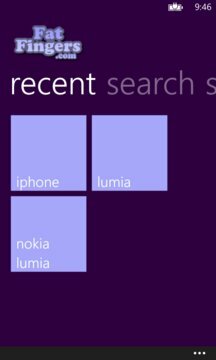 For example, an item listed as "nokia lunia" won't show up in searches for "nokia lumia". 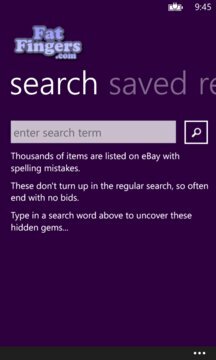 This app lets you search using fat fingers, you can search, saved searches, pin searches to the start menu, you can even add an item to your ebay watched items list, all from within the app. We love feedback, so do please give us your reviews and feedback. However, if you're getting any problems with the app, do email us at feedback@fatfingers.com as often problems can be resolved pretty quickly. We can be contacted on twitter (@MrFatFingers), Facebook (facebook.com/fatfingerscom), and email (feedback@fatfingers.com).